In development for over two years, the Profile is a stretch ballet slipper conforming to the foot like a second skin and manufactured from a textile exclusively constructed for MDM: a high tensile anti-bacterial material designed to last. 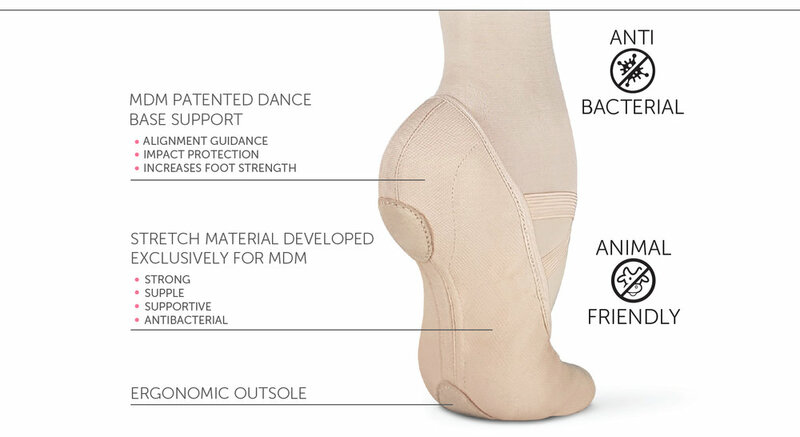 Incorporating MDM’s patented Dance Base Support, the Profile offers optimal performance features coupled with all the unique safe dance practice essentials you’ve come to know and love about MDM. The vegan friendly Profile is completely free of animal products. Every ounce of our passion and dance experience has been injected into the development of this shoe and we’re so confident the Profile is the world’s best, that we urge dancers to compare the Profile against all other stretch ballet slippers. The potential of a stretch shoe is that it lends itself to an effortless fit and seamless look. With the Profile, that potential has been realised. The Profile allows for superior comfort and the smoothest fit yet, combined with flawless aesthetics. And the MDM Profile is the only stretch shoe that combines these cosmetic ideals with safe dance practice and injury prevention essentials. This video shows the built in MDM Dance Base Support technology, which provides support and alignment guidance to protect the dancer, united with the ultimate clean line at the arch.